By popular request we are pleased to offer our Members your own Together We Served Military Store with a whole range of items to peak your interest including custom shirts and caps, jackets decals, badges, automotive and items for the home. 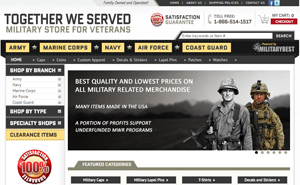 Our Store is offered in cooperation with Military Best, one of the most trusted suppliers in the United States, who offer a 100% Satisfaction Guarantee on all items purchased. Many items are made in the USA and a proportion of the proceeds from your purchase help support our military’s underfunded MWR programs. Please browse the Together We Served Military Store and let us know at admin@togetherweserved.com your comments regarding what you like, what you like less and if there are any additional items you would like us to stock.